Alastair Cook has called Graeme Swann a "so-called friend" after the former England spinner called for him to quit as captain for the World Cup. 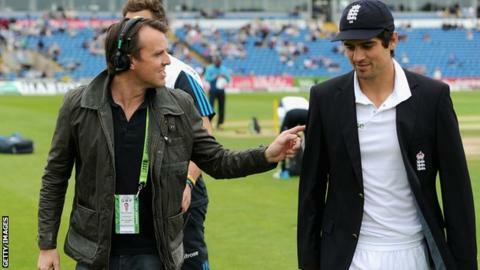 Swann told Test Match Special that former team-mate Cook "shouldn't be bothering playing one-day cricket". But Cook said: "I don't think it's that helpful, especially from a so-called friend." Cook was speaking after England's 133-run defeat by India in the second one-day international in Cardiff. Swann said Cook's one-day strike rate - currently at 77.98 runs per 100 balls - does not set the tone that will make England competitive in next year's World Cup in New Zealand and Australia. "He's entitled to his opinion, but it's not ideal for me, especially when you get through the summer I've had," said Cook, who has had to resist calls to quit as England's Test captain. Cook also confirmed he had not spoken to Swann about his views, but added: "The phone is always open the other way. "I am a little bit (disappointed) because he is a good friend of mine and has been a supporter. "It's not helpful at this time, because I am going to be captain in this World Cup. "I've done it for three-and-a-half years. We're going to build up to that, and we've got a good chance."